Last edited by 20ws6speed01; 01-26-2011 at 01:29 PM. nice good luck when getting her tunned let us know horsepower numbers once u get it tunned. Sent PCM to Frost because I dont think she'll make it to a dyno(not running very good)...should b on the road next week...Can't wait!!! That's the smallest of the thumpers they make. I'm running the Mutha-Thumper (the middle of the 3 versions). Did you degree it? 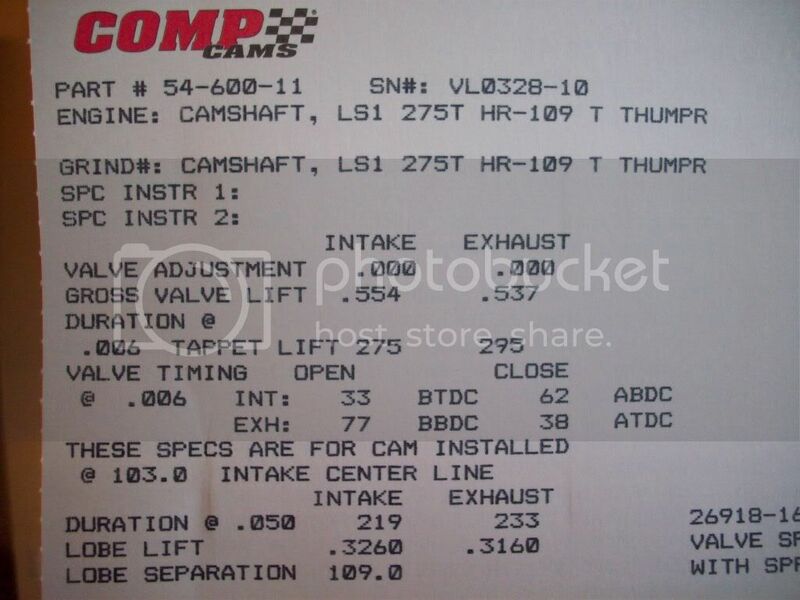 I see on your cam card they are calling for a 103* intake centerline. That's 6* advance from your 109* lsa. Mine was a 107* lsa with an intake centerline of 102*. Not as much advance ground into mine. They make a nice flat torque curve that comes in quick and stays there. Damn sounds good man can't wait to see the numbers after the tune!! yeah I would be interested in the numbers. Just a heads up,,,,the tight LSA and the overlap these cams have don't produce alot of vacuum. Your power brakes might have fits. I run mine in a 406 and even that large of an engine still only produces about 6-8 inches of vacuum at idle. Just got the PCM back in...Plan on taking her out tomorrow if it's not raining...no more stalling out..
Sweet you should take a video of it to, can't wait to see how she runs what does she idle at now? what kinda heads are on it? That's what an early flat torque curve will do for ya. Makes for a very fun street car. It's so much FUN now!!! yea id like to know the hp numbers as well....especially with stock heads...if its nice, i may go with somethin like this. did u have to put in different lifters or anything else when you put the cam in? or did you just put the cam in and go? well with the tune of course too haha..im very interested in doing this and just wanted some input on your setup. sounds great btw! I wouldn't get too caught up on HP numbers. That's not what this cam was really designed for, although it should make respectable HP. They shine more with a nice flat torque curve that comes in early in the rpm range due to their tight LSA. That's what makes the car fun to drive. I run the bigger version of this cam, and Comp says it starts making power as early as 2,000 rpm and peaks at 6,100. That's in a little 350. I'm running it in a 406. I can tell you it makes gobs of torque nearly right off idle and has extremely snappy throttle response. LS3 Supercharger Install - Street Thumper!